For an extempore on - We should save! thats the problem sometime when .. there is difference in thoughts process ! Saru, i could relate to each line on shopping and otherwise. And loved the cute cups. Thank you and the picture is really cute. I am thinking of gifting it to my husband on our anniversary. Brilliant Saru ! its a full deal ... for every couple. LOL! Thanks for reading, Kokila. Hilarious ! You compose with with nonchalant ease ! LOL! I wonder what he will say. Lovely and cute :) Brilliant again. I laughed out loud, I liked how Mr.Ramakrishnan has put it...It's hard to pick which one will be my fav stanza :) Although I will say I enjoyed the 2nd stanza very much. But beware, this is the perfect recipe that you can find in every successful marriage... 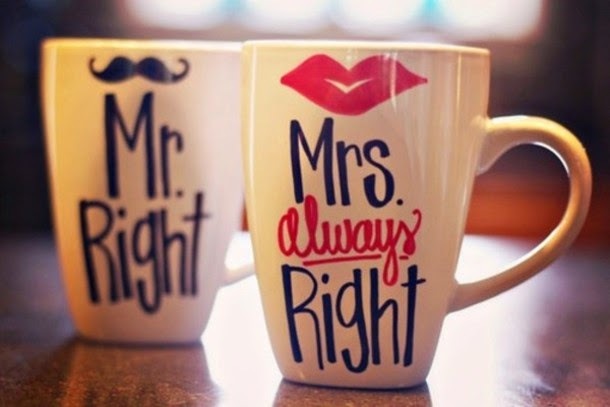 There is this Mr.Right and Mrs.Always Right .... :) superbly written and a joy to read. Most wives have faced the truth in second para. Thank you so much for reading and I look forward to read your comments. So what did, Mr.Right say after reading this, Saru? Short and sweet. But firmly states the nuances of a married life! Loved reading it! Let's try this again, may this time I will succeed in commenting! It was beautifully worded, as always, and the rhyme was great too. It was a very light composition so it went like a breeze. You should try recording it on Sound Cloud. When you will get married, I will ask you then. I will try to record and upload on sound cloud. Very beautifully composed poem Saru. There's the spark of mismatch that matches the couples. Because his missus is Mrs Always Right. I tried. Pathetic, isn't it. It's wonderful and I bet, Alok will love it. Such truth and wisdom, Saru :) Fantastic. cute poem which says quite much between the lines..
Yeah, on anything which he finds not worthy that particular moment. Life, sorry, married life, sigh! Thanks Pranali and welcome here! Ha ha ha...very sweet and lovely!!! !